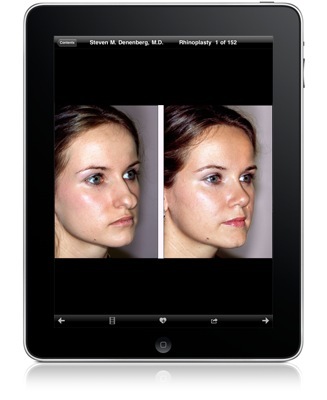 The application displays over three hundred before and after photographs of Dr. Denenberg's facial plastic surgery patients. You may also drag the photos or swipe the screen to move to the next or previous photo. Tap the screen to show the navigation bars if they are hidden or hide them if they are showing. ... which gives you various contact options. 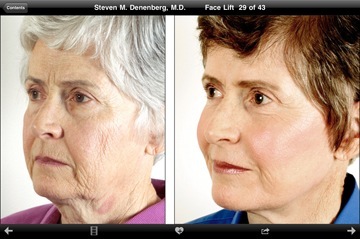 Email Dr. Denenberg for a free online consultation. This menu also allows you to start a Slideshow, where the photos cycle every few seconds without your intervention. 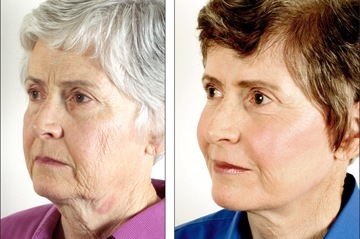 While looking at the before and afters, you can jump right to the photo you want to see. Scroll to the thumbnail of the photo you want to see, and touch the thumbnail to jump right to that photograph. 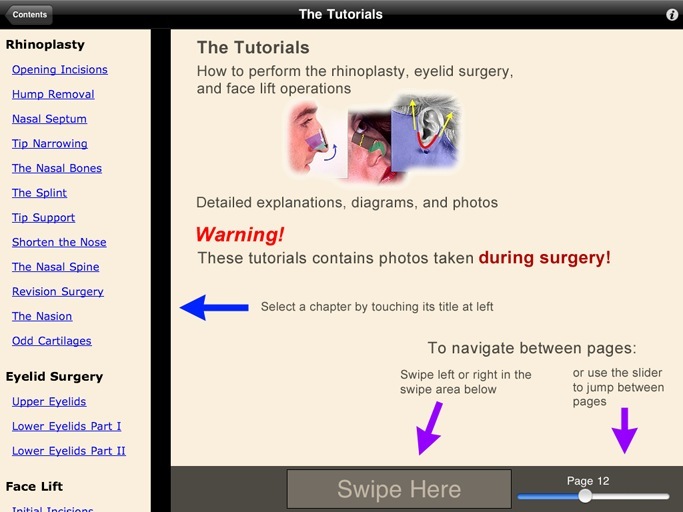 The Tutorials show you how the rhinoplasty, eyelid surgery, and face lift operations are performed, with photos taken in the operating room during surgery, and detailed diagrams and explanations. 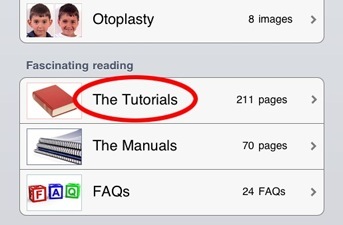 You first select a chapter to read, then move among the pages of the tutorial by swiping in the grey bar at the bottom of the page, or by using the page number slider. You touch the pages to scroll down to read the entire page before proceeding to the next page. 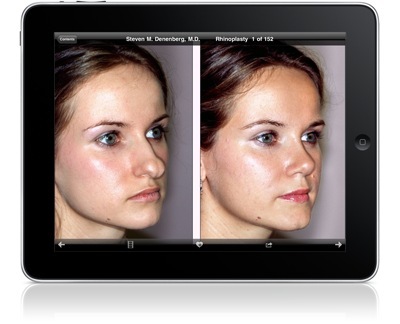 ... which contain explanations of what the operations can accomplish, how to tell if you are a candidate for an operation, Dr. Denenberg's instructions to his patients, what it's like to undergo surgery, and details of how a patient takes care of himself after having surgery. 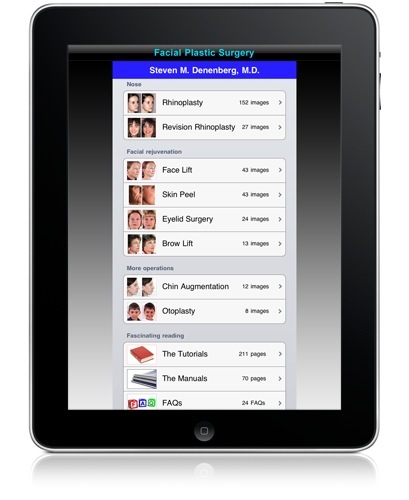 The FAQs are self-explanatory, and are educational reading about various topics in plastic surgery. 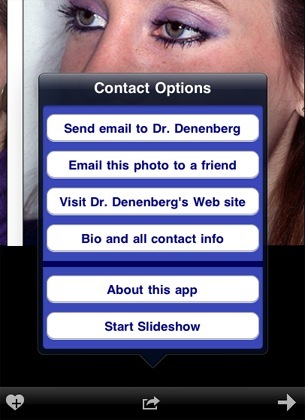 When the app launches, it checks with Dr. Denenberg's server to see if there are new photos to download to your app. 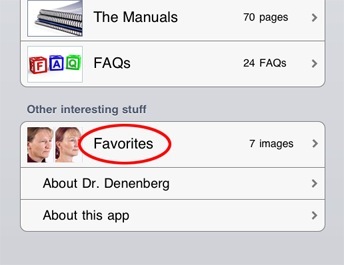 If new photos are ready for downloading, they will be added to your app automatically. You won't have to take any action. Apple, the Apple logo, iPad, iPhone, iPod, and iTunes are trademarks of Apple Inc., registered in the U.S. and other countries. iPhone is a trademark of Apple Inc.